I recently found this awesome digi at Designed2Delight. For whatever reason I became obsessed with creating a 3-D look with this. My original plan was to do a Diorama card, but as I tried to think of the layout, I wasn't impressed with my ideas. Then I saw this modified version of a frame card that folds flat. This seemed perfect for my little city. I printed the image out three times. Colored the main image then cut out and colored the front wall. I also cut out the small building directly behind the wall and colored it, as well as cutting and coloring the two small buildings one each side of the top building. I used various size pop ups, and some rolled pot dots to create a 3-D look. I have a picture tutorial on the layout and sizes, you can go to the bar at the top of my blog and click on tutorials to see it. This was a challenge and for sure will go to someone special, but overall it wasn't hard once I figured out my measurements and the paper I wanted to use. The overall size of the card is 5.5 by 5.5 and because it is a bit thick, due to the 3-D effect and layering, it will need a 6 x 6 envelope for mailing. Or you could use a padded envelope to protect it more. It was great fun and to do and I already have ideas for a few more with totally different image in them. Little by little I am eeking out some Christmas cards between other things that need to be done. 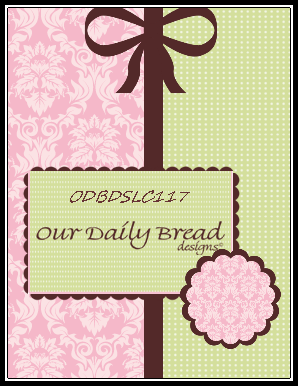 Followed the sketch for a challenge at Our Daily Bread Designs for this card. This sentiment is one of my favorite from Morningstar Stamps. When we were in the St. Louis area I participated in several drama productions through our church during Christmas, and Easter. Our pastor wrote his own plays, which usually had a very contemporary take, with vignettes from Biblical times. So, I was drawn to this sentiment when I first saw it while shopping at a stamp show. 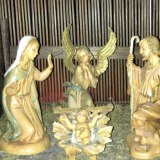 What a great gift the Baby Jesus was that quiet night. This is my design for the challenge and as part of the Design Team....Click here to visit the Dream Valley Challenge Blog and join us for some fun and prizes. Angelique is a very good friend of Lydia's who recently had some surgery go bad. Angelique went in for emergency surgery just before Labor Day. It was nothing life threatening but the surgeon ended up making a mistake during surgery which resulted in a second surgery. She ended up being in the hospital for three weeks and believe it or not, has at least one more surgery to go! How on earth did that happen? She has a long road ahead of her and needless to say, needs a little teapotter love to get her through what lies ahead! Angelique is an artist and a professional editor by trade for the University of Kentucky. She loves to make crazy little bat girls out of paper and her Twitter name is Paperbatty. She loves Halloween and loves Spookey stuff! Lydia's nickname for her is Batty or Battypants. Angelique also has and simply loves chihuahuas. Hers are rescues and she has one that dances for her! Supplies: Spellbinders, Dollar stamp, Mark's Finest Things Sentiment, Penny Black Cat, Martha Stewart punch, Copics. Its was my sister's Birthday last week....this is the card I made for her. Whenever I have traveled with her it has been a standing joke about how cold we have to keep the room at night - I'm pretty sure at home she sleeps with the fan on high!!! So when I saw this stamp by Bugaboo I couldn't resist getting it to color and send to her. I am partial to shaped cards and decided to make this as a twisted easel card, based on Beate's tutorial at Splitcoaststampers. Pretty sure she will get a nice chuckle out of this when she receives it. 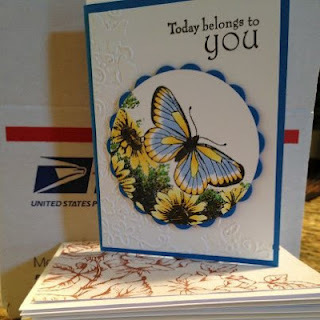 Its "Hope you can cling to" over at Splitcoaststampers the entire month of October. Each day has a challenge you can participate in making a card, and then hopefully putting all those cards in the mail to Anderson Cancer Center in Houston, Texas. So far I have manged to get three challenges done, two I am still working on. Beate's challenge certainly took me out of my box for colors, using grey with a pop of color, but it was fun, and I really liked the finished project. Yesterday's challenge was to make a cupcake holder or box....which of course can't be sent...but we were also asked to make a card with it. Boy - talk about a challenge. First and foremost a cupcake NEVER needs a holder in my house as it disappears much too quickly for such a thing. I do like a good challenge though, so I made a cute little holder on a pedestal (not nearly as cute a the other participants, whose creations I am still drooling over)......and a sweet little card with a couple of cupcakes to match. The BEST part of the challenge was HAVING to go to the grocery to buy the cupcake that went in the picture, which of course, after I had handled it, HAD to be eaten :) - it was a rough challenge but I got it done. Today we are using five words on the front of the card as our focal point - being the over achiever I sometimes am (aren't all stamper) I used five words on the inside and the outside. If you have a chance you should visit Splitcoaststampers and join in the fun. Recently I have been working on some masculine cards for the church....I used this layout with a great scripture and scene stamped in the background from Our Daily Bread Designs. While I was working I saw this image I had colored peeking out at me and decided it would look great in this same layout. This is my newest Floral Ovals die from Spellbinders and the stamp is a recent purchase from Sutter Stamps, they have some great images, as well as scenes. Operation Write Home has a challenge going on for masculine cards so I am going to enter this there. Like the style of this stamp and layout so much I will probably make a set of them to take to the ranch to a friend. Challenges: Our Daily Bread Designs August Challenge, Operation Write Home. My oh my, how the weeks are flying by. I am finally using both arms after my surgery - not that being one armed stopped me from doing some stamping......stamping is a real form of relaxation for me. I just had to plan my cards out and take my time, and use a lot of straight cuts. Nice to feel comfortable using all the tools I have at my disposal, and be able to color with my Copics again. This card is for the church bookstore.....they tell me they need some more and I am happy to oblige. I will also put it in a few challenges because its always fun to put your name in the pool to win something. Supplies: Spellbinders Lattice Motif, Cheery Lynn vine, McGill Stylus, Gold Leaf Pen, Mango Frost Matstack, Stampin' Up Trust God. This little cutie from Mo's Digital Pencil "Little Umbrella" screams summer....and I think now that it is mid August (and kids are back to school here) I have realized all those things I meant to do to celebrate the sun. When we were at the Ranch I had to watch my sun time by the pool, and riding (not easy when its 110 degrees) as the medication I was on warned me to be cautious....I decided to follow the directions and did not get to spend the time I so enjoy in the pool and basking in the sun. Now, before I know it, summer is just about gone! So why not color up this lovely lady. When I began coloring her I posted her in process on my Facebook page. One of my friends, who is in charge of Cross Walk Bookstore in Missouri (where I send a lot of my Christian cards for sale) challenged me to put some scripture to it and send it to them. Loved the challenge - while there were some scriptures I thought of, I just happened to get a Stampin' Up order in the mail a few days later and lo and behold my Trust God set contained what I think is a perfect sentiment. "Each one of us is God's special work of art". Inked it up, put it on paper, and viola - a card that makes me 'smile'. I am in the process of coloring and putting a few more of these together as I think it is the perfect birthday card for a few of my friends. Women of the Wild West - woo hoo - got me my cowboy. After losing to higher bids on e-bay a sister stamper hooked me up. A little across the continent negotiating and at long last I had him in my arms....thank goodness I have an understanding husband! The Man's a little used, but what man isn't LOL!! Some of the ladies at Splitcoaststampers have a little rivalry going on about the Man here - I made this card for the Get Dirty Masculine challenge. I have been waiting for the little buckaroo to arrive for a week with this card in mind. I do like my western stamps. When I was going through the aisles of JoAnn's Fabric recently I came across this sweet pad of paper called Beaches, by Paper House. It contained several great 6 x 6 sheets of scenes perfect for beach type stamping......Couldn't wait to try it out and was thrillled when I saw the Teapot Tuesday Challenge was a destination card with a challenge to show the weather on a card, inspired by the lyrics from a song. With this background, and a love of the beach, the song Good Day Sunshine by the Beatles popped into my head (didn't have a rub on with those words, so I used these). Now I am humming the words: I need to laugh and the sun is out, I've got something I can laugh about. I feel good, and it's a special day, I'm in love and its a sunny day! - I can just about feel the breeze of the ocean as I toss my head back and hum on my imaginary beach. Inside I have computer generated the sentiment - "Life's a Beach, Enjoy It" with some cute little flip flops in the corner. I will be putting this in the mail to a sister Teapotter this week and I hope she feels the peace it is meant to bring her. 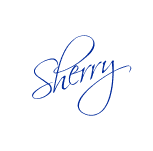 I am having shoulder surgery Monday and may not be able to stamp for a week or two - but you can bet I will try. I prepared this a day early. To make the challenge even more fun, we will be giving out a prize, a $15 gift certificate to be used toward stamps at the Our Daily Bread Designs store!! Entries for the prize must be submitted by Sunday, August 5th at 8 p.m. EST. One random winner will be chosen and announced next Saturday. While it is not required to use Our Daily Bread Designs images and sentiments on your creations, we would love to see them if you have them. As a way of recognizing those who do use Our Daily Bread Designs stamps, we will again be choosing three or more of our participants for the Shining the Light Award . In order to qualify for this award or join the challenge, however, you must use Our Daily Bread stamps and have your submission added to Mr. Linky by Sunday, August 5th at 8 p.m. EST. If you upload your creations to Splitcoast Stampers or any other online gallery, please use the keyword isODBDSLC117. When creating your posts on blogs please include a link to the challenge. I turned my layout sideways, and instead of ribbon I chose to do flowers in its place. I was just in a pink mood when I was laying this out. my flowers are handmade, they are easy and fun to make and I have a picture tutorial you can view here. Stretched the take a little, but it is exactly what I had in mind when I started so I am happy. and 'hey' its all about me isn't it - LOL!! My sentiment is from the Quote Collection 2. Have as much fun as I did playing. See I told you I wouldn't use the sea this week, it was tempting. Materials: Our Daily Bread Design Quote Collection 2, Spellbinder Dies, Memory Box Flower Die, Zva Pearls, Cheery Lynn Butterflies. A few weeks back I saw this sweet horseshoe die by Provo Craft used on a card, I knew I had to have it, and was able to find one for sale on e-bay. When it arrived I couldn't wait to use it. The first set of horseshoes I made were with a pewter colored paper and I scuffed up the edges with silver ink. Once I laid the card out I determined I needed a different color horseshoe. I ran the die thru my CB again with brown paper and used my gold Color Box ink to scuff the edges, giving it a nice used patina. This Mustang stamp is a favorite of mine from Serendipity Stamps.....so regal looking. While I wanted to use my new horseshoe die, I will have to admit that this card really ended up being about the inside. I am not sure what this layout is called but when I saw it here I had to try this cut and fold technique. It was pretty simple, all I needed was a 5" x 10.5" piece of card stock, a few cuts, and scores an inch wide, and viola -- a lovely looking and unique pop out for my inside. I made a second card with some fabulous polka dot paper, its is posted over at Splitcoaststampers. When I was finished with this card I gave it to my friend Lori who owns a beautiful thoroughbred named Tuscany - I thought she would appreciate it. This week's challenge is Sun/ Clouds (116). To make the challenge even more fun, they will be giving out a prize, a $15 gift certificate to be used toward stamps at the Our Daily Bread Designs store!! Entries for the prize must be submitted by Sunday July 22nd at 8 p.m. EST. One random winner will be chosen and announced next Saturday. While it is not required to use Our Daily Bread Designs images and sentiments on your creations, we would love to see them if you have them. As a way of recognizing those who do use Our Daily Bread Designs stamps, we will again be choosing three or more of our participants for the Shining the Light Award . In order to qualify for this award or join the challenge, however, you must use Our Daily Bread stamps and have your submission added to Mr. Linky by Sunday, July 22nd at 8 p.m. EST. If you upload your creations to Splitcoast Stampers or any other online gallery, please use the keyword is ODBDSLC116. When creating your posts on blogs please include a link to the challenge. I promise next week to leave the beach behind as this is the second time I have used a beach scene.....can you tell its summer..... I find the ocean a peaceful and wonderful place to visit - whenever I stand at the edge of the beach with the water lapping up on the shore, tickling my toes, I truly feel the magnificence of God and all that He has created. The Teapot Tuesday challenge at Splitcoast Stampers was all about girafffes for Alex. She is a 17 year old who has had some serious health issues with complications from her Chrones. This challenge is a destination challenge where we make cards with a specific person in mind and send them to them. Alex likes giraffes, when the Teapotters are done with her she will have a herd, jungle, or whatever, lining her dresser. 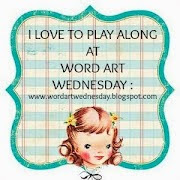 It was a 'tall' challenge for me this week (tee hee, I made a funny) - especially since I don't have any giraffe stamps...I mean I can do western in my sleep, but a giraffe, oh my - what to do. Just had to draw my own and color her up. So I can safely say this card was made with no stamps damaged in the process...a first for me. Enjoy. ....is Torn or Distressed (115). To make the challenge even more fun, we will be giving out a prize, a $15 gift certificate to be used toward stamps at the Our Daily Bread Designs store!! Entries for the prize must be submitted by Sunday July 15th at 8 p.m. EST. One random winner will be chosen and announced next Saturday. While it is not required to use Our Daily Bread Designs images and sentiments on your creations, we would love to see them if you have them. As a way of recognizing those who do use Our Daily Bread Designs stamps, we will again be choosing three or more of our participants for the Shining the Light Award . In order to qualify for this award or join the challenge, however, you must use Our Daily Bread stamps and have your submission added to Mr. Linky by Sunday, July 15th at 8 p.m. EST. If you upload your creations to Splitcoast Stampers or any other online gallery, please use the keyword is ODBDSLC115. When creating your posts on blogs please include a link to the challenge. This challenge made me stretch myself as torn and distressed are not my typical look or style. While shopping recently I came across this sweet cross and purchased it for a whole penny, yes - you read that correctly, a whole penny.......it was too good of a deal to pass up! I sponged some distress ink over it and then dabbed it with some brown Color Box ink. With my Spellbinder Fluer De Lis Die I cut a frame. Then I stamped one of my favorite sentiments from the set "Pray" from the "Full of Grace" collection, onto the same design paper I used for the base. I roughed up the edges of the base as well as the piece holding the sentiment and rubbed some ink around those edges. A rhinestone in the center of my cross and the corners of my die completed the look. On the back of the envelope, for this card, I stamped the Grunge Cross from the "Never Give Up" set. Thanks for stopping by. Recently I was inspired by a card I saw created by Marianne' Papirverden with this fold, and wanted to try my hand at it. I have figured out a few things doing this, one being you do not want to use a really heavy cardstock for the base of the card, it makes this really thick to fold....and if I do another (which I most likely will) I will probably do it more like hers and round the outside panels. I am also considering using a brad on the next one so that the top swings up to hold a message as well as for a signature, as it is now you would have to write a note and sign the back of this. In spite of what I learned I do like this, I am especially fond of the DP, a very feminine look. You can find Marianne's blog by clicking above if you want to see her card, it is quite lovely. ....is anything goes (114) but it must use Our Daily Bread Stamps. To make the challenge even more fun, we will be giving out a prize, a $15 gift certificate to be used toward stamps at the Our Daily Bread Designs store!! Entries for the prize must be submitted by Sunday July 8th at 8 p.m. EST. One random winner will be chosen and announced next Saturday. While it is not required to use Our Daily Bread Designs images and sentiments on your creations, we would love to see them if you have them. As a way of recognizing those who do use Our Daily Bread Designs stamps, we will again be choosing three or more of our participants for the Shining the Light Award . In order to qualify for this award or join the challenge, however, you must use Our Daily Bread stamps and have your submission added to Mr. Linky by Sunday, July 8th at 8 p.m. EST. If you upload your creations to Splitcoast Stampers or any other online gallery, please use the keyword is ODBDSLC114. When creating your posts on blogs please include a link to the challenge. There are many places I like to shop for craft supplies. Recently at Michael's I found these fabulous $1.00 frames and bought a 'bunch' in different shapes and sizes. This design has been in my head since I first saw this oval. I covered the frame with a paper that has an old wood look. The image and sentiment are from Our Daily Bread Design "Light of the World" set. It was colored with my Copic's and sponged in Stampin' Up Bliss Blue around the edges. It just seemed to call out for some shells, which also happened to be found at the same store as the frame. You have to love those $1.00 frames that Michael's sells......at least I do. The overall dimension of this frame is 5 x 5, the inside measures 3.25 x 3.25. Using my largest Fleur De Lis Square Nestie with some black linen cardstock I ran this through my Grand Calibur. Then I took the cardboard piece that was in the frame and laid it on top of the piece I ran through my machine and traced the square inside of it....I then used my Fiskars cutter to cut around my marks (if you have a square die you could probably use it instead). In the meantime I cut a piece of 5 inch by 5 inch DP from K & C (Ancestry.com design) and trimmed the inside the same way, using the cardboard inset that was in the frame. I glued the DP to the front of the frame that I had previously painted with some acrylic paint in the color Caramel Candy. Then I ran my die cut through my Krylon machine and placed it over the DP. Using my Cheery Lynn die I made a few leaves and placed them in the corner of the frame, then I added a few of my homemade flowers I had from a previous project. On a recent trip to the craft store I found some cute Metal embellishments in a butterfly design that I used as well. On a piece of good CS I used my Stampin' Up More Mustard Ink and stamped the Branch and Butterfly stamp from the Our Daily Bread Designs Faith set (it was too strong to stamp directly on my piece, so after inking I stamped it once on scrap paper and then onto the CS). I then used an Impression Obsession stamp for the sentiment. This was so fun and I have so many ideas about ways to use this frame, thinking Christmas, small group gifts, family.......a pretty endless list of ideas and styles are rolling through my mind. Most of the cards I make are for friends, family, Church or the Ranch.....but there are many that I play around coloring and following through on ideas I have. This week I took those cards that didn't have a specific purpose and boxed them up for shipment to OPERATION WRITE HOME. These cards are sorted and sent overseas by a group of volunteers. When they arrive our soldiers can look through the very well organized selection and take cards they want to send to family, friends, and loved ones. So glad to know something I have created will be used by someone who serves this country and defends my freedoms. God Bless them all. Consider sending some of your cards to this very worth while group! !